2019 sees the beautiful Sapphire Princess based in Southampton during her spring and summer season. 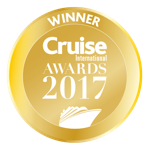 Cruising gorgeous destinations in the Mediterranean, northern Europe, Canada and New England, many of the varying itineraries will be enhanced by some exciting celebrity guest speakers. Between April and October, guests will have the opportunity to see famous faces including Linda Gray, David Walsh, Ann Widdecombe, Duncan James, Eddie 'The Eagle' Edwards, Allan Dennis Rich, Des O'Conner, Tessa Sanderson CBE, Paul Burrell, Fatima Whitbread, Samantha Bond, and Gok Wan. Sapphire Princess is the second of only two Princess Cruises ships to have been built in Japan. She may boast a more exotic background than most of the Princess fleet, but she doesn't lose out on any of the cruise lines signature features, incredible food and personal choice cruising. If anything it merely adds to her charm. She is the sister ship of Diamond Princess and the ships sometimes meet during the summer season while they cruise Alaska's stunning inside passage. Dining onboard the Sapphire Princess is as spectacular as can be found on any of Princess Cruises ships. Choose form traditional set dining in the International Dining Room or the personal choice dining option with the Anytime Dining restaurants. Treat yourself to Princess Cruises signature restaurant, Sabitini's Italian Trattoria one night, or try out the Sterling Steakhouse for the finest steaks and freshest seafood. For a quick bite head to Horizon Court and take in the panoramic views from the buffet dining venue, or check out the outdoor pizzeria and hamburger grill out on deck. Whatever your mood there is a dining choice to suit onboard the Sapphire Princess. The Sapphire Princess offers a combination of elegant entertainment with the glamour of Broadway inspires shows. Dress to impress at the Captain's cocktail party or sit back and enjoy the live music in the Wheelhouse bar each night. The Vista Lounge offers a great variety of shows and the Grand Casino is a great place to try your luck on the tables or with the slot machines. Whatever your mood there will be something onboard to suit your needs. Treat yourself to an afternoon in the adult only Asian inspired Lotus Spa for a selection of relaxing therapies and treatments or just to take in dip in the adult only Lotus Pool. There is also a full beauty salon if some pampering is on the agenda. For those looking to keep to their daily routine, or in need of burning off some of the incredible food, head to the state of the art fitness room. With the latest equipment and fully trained staff on call, there is everything you need to keep your fitness regime up, or start a new one at sea. Why not take a relaxing yoga class? Why not try out one of Princess Cruises enrichment programs or pop into the Art Gallery and enjoy the fabulous pieces on show? The Kids and Teens centre offers children great activities and place to escape. For your duty-free shopping head into the Boutiques on sea days. Onboard the Saphire Princess the dress code is both informal and formal, depending on the evenings theme. Formal nights, such as the Captain's cocktail party, are often the highlight of the week with gentlemen doning black tie and ladies slipping into their favourite elegant dress. Informal nights onboard are a smart casual dress code, with sport jackets and blazers expected for gents. For the quiet evenings, where yo don't fancy dressing for dinner, or you are tired after a da of shore excursions or spa treatments, you can head to the buffet restaurant, where casual attire is suitable, if not expected.